Heat and eat with a mushroom ravioli, cooked squash and a sage-infused brown butter. Even squash naysayers will be tempted by this restaurant-quality vegetarian meal. Use frozen squash or canned pumpkin and this meal is ready in less than 30-minutes! As fall approaches, gardening in Wyoming is quickly coming to an end, but I intend to enjoy these flavors for as long as I can. I’m in packrat mode as I squirrel away the remains of the day. I’ve made tomato jam, plum jam, and peach ice cream. I’ve made herb salt, rosemary salt, and lemon verbena sugar. I’ve frozen corn, tomatoes, chiles, and squash. 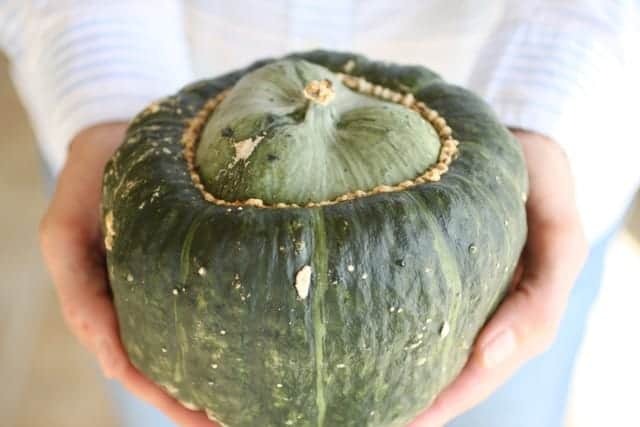 Squash plants seem to grow with leftovers in mind, either as a prolific plant or the size of the vegetables. Winter squash are the harder varieties such as Butternut, Hubbard, Kabocha, Buttercrisp and Acorn. Roasted winter squash can be served as a side dish, then tossed in tomorrow’s salad, stirred into pasta with a spoonful of ricotta, or pureed for soup, such as Thai Squash soup. Cook the squash by placing the whole squash on a baking sheet in a 375°F oven. Cook 60 minutes or until squash is soft and the sides buckle. Remove from oven, allow to cool. 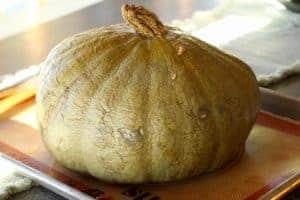 Cut squash, peel off skin, remove seeds. Or trim the skin, cut into cubes, toss with canola or olive oil. Heat baking sheet and oven to 400°F. Pour squash on hot pan, smooth into a single layer and separate the cubes (you don’t want to pan too full), sprinkle with salt and pepper. Roast for 15 minutes, stir, cook 10-15 minutes more, until squash is tender. Cooked squash freezes well. Scoop the pulp into freezer-safe containers and remove as much air as possible. Pack in freezer container, leaving ½-inch headspace. Seal and freeze. Find specifics on preserving food at the National Center for Home Food Preservation. Thaw before cooking. Instead, I think this pasta dish is the ticket. Italian food feeds my soul. 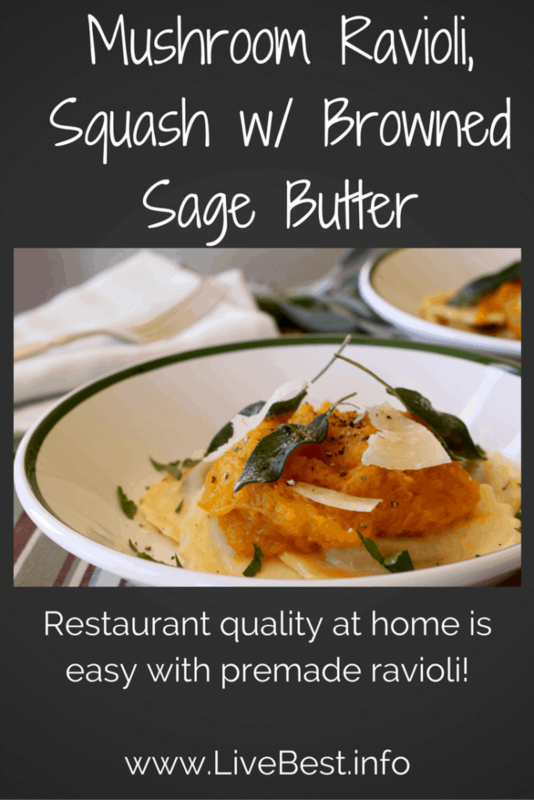 I love fresh pumpkin tortelloni and ravioli with sage and butter. Especially when someone else makes those little pasta packages. 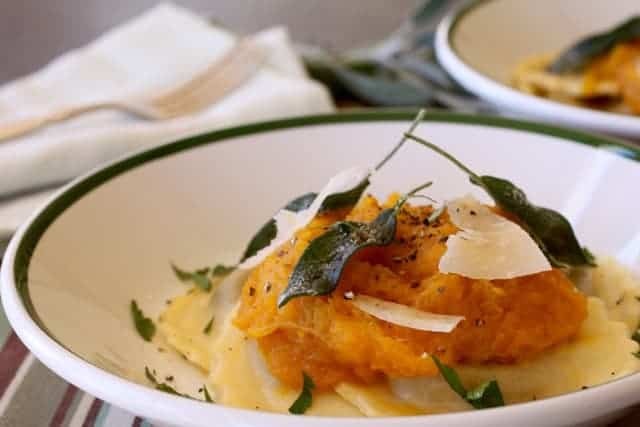 Wanting the flavors of Italy without the work, I developed this simplified version of heat and eat with a packaged of refrigerated mushroom ravioli topped with cooked squash and a sage-infused brown butter. Flavoring butter is so simple. As you melt butter in a pan over low heat, add herbs. Simple, right? Even squash naysayers will be satisfied by this flavorful meal. It’s restaurant quality. It’s so good I’ve served it for Christmas Eve dinner. With a busy life, the freezer is your friend. That frozen squash makes dinner quick and delicious, even for holidays. But you can also use canned pumpkin instead of the squash. 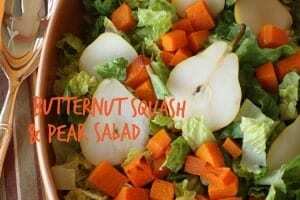 **Check out other LiveBest squash recipes. To freeze herbs, you can just rinse, dry, and freeze. But blanching them in boiling water for just a few seconds before freezing helps retain color and flavor. If you wrap the herbs in paper towels or waxed paper before freezing, they’ll be easier to separate when you want to use them. P.S. 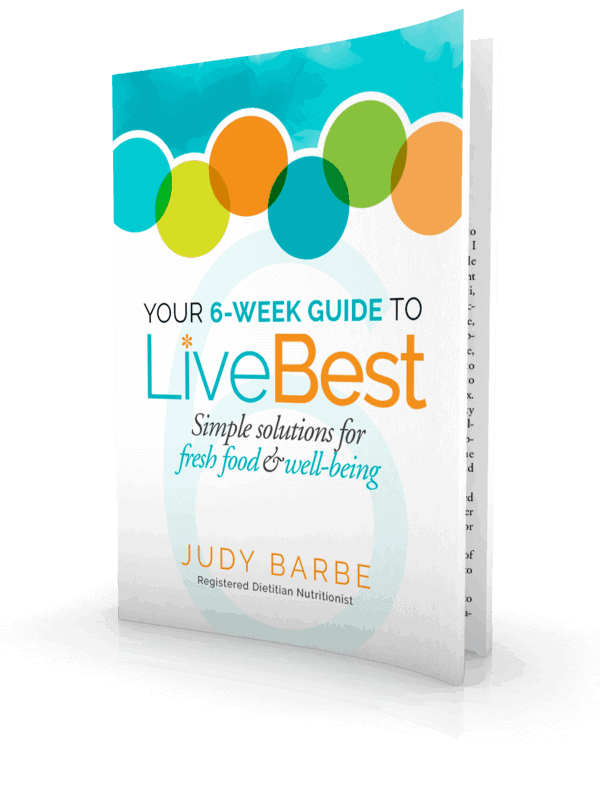 If you like this recipe, you may want more healthy eating tips and recipes. Sign up for my newsletter here. 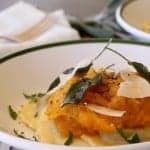 Heat and eat with a mushroom ravioli, cooked squash and a sage-infused brown butter. Even squash naysayers will be tempted by this restaurant quality meal. Cook the squash by placing the whole squash on a silicon-lined baking sheet in a 375°F oven. Cook 60 minutes or until squash is soft and the sides buckle. Remove from oven, allow to cool. Cut squash, peel off skin, remove seeds. Scoop the pulp into freezer-safe containers and remove as much air as possible. Thaw before cooking. Cook ravioli according to package directions. Drain, but keep back some water. Add defrosted squash to a saucepan; heat slowly over medium heat. Add pasta water to thin. Season with 1/2 teaspoon salt, 1/4 teaspoon pepper and nutmeg. Cook until heated through. In a small skillet, melt butter over low heat. Add whole sage leaves. Cook butter and sage, stirring occasionally until butter begins to brown, 4-5 minutes. Watch closely as it can quickly go from brown (nutty) to black (burnt). When ready to serve, place cooked pasta in servings bowls, topped with squash. Drizzle 1-2 teaspoons browned butter over squash. Top with fried sage leaves. Sprinkle with cheese. Cooking time reflects baking a whole squash. 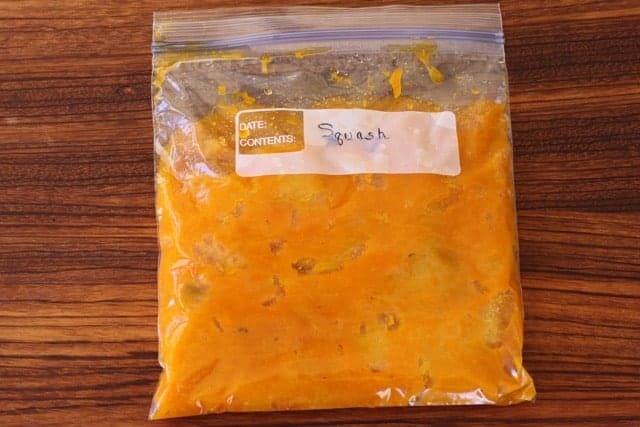 Save time by buying frozen cooked squash or use canned pumpkin.